There are still approximately 13,000 seats available for Sunday's Packers playoff game against the 49ers. GREEN BAY, Wis. — It can take a lifetime for Green Bay Packers fans to move all the way up the waiting list for season tickets. The demand for tickets to Sunday’s wild card game between the Packers and San Francisco 49ers, however, is significantly less. With five days before kickoff, approximately 13,000 seats are still available for the game, a Packers spokesperson told FOXSportsWisconsin.com. Tickets were initially made available exclusively to season-ticket holders on Monday morning. The inventory at the time had nearly 40,000 tickets for sale. By Monday afternoon, tickets were made available to the general public. In that 24-hour period, somewhere in the vicinity of 27,000 tickets were sold. The team originally had a four-ticket limit for each purchase, but as of Tuesday afternoon, that has been lifted, allowing bigger groups to sit together. 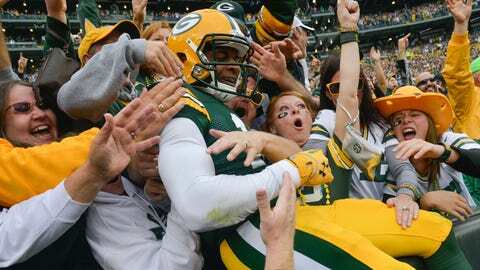 Green Bay’s last-minute, come-from-behind victory over the Chicago Bears in Week 17 clinched the NFC North for the Packers for the third consecutive season. Despite a record of 8-7-1, it also gave Green Bay an opportunity to host a playoff game. The 49ers, tied for the NFC’s second-best record at 12-4, finished one game behind the Seattle Seahawks in the NFC West. San Francisco knocked the Packers out of the postseason a year ago and also beat Green Bay in Week 1 this season. With Aaron Rodgers and Randall Cobb back — but with Clay Matthews out, the Packers have an opportunity to return the favor to the 49ers this weekend. In the meantime, the Packers are waiting to see whether Lambeau Field will be at full capacity for the game.